His passion for the game of hockey is second only to his love for the tricolour. He exults, leaps with joy, sheds tears of sorrow, and emotes on the field, making no effort to control the fire burning within. A fire that was sparked by a premature retirement as a player who fell victim to the vagaries of politics. Rather than let the despair douse the flames within, he took to coaching, determined to contribute to the resurrection of the game he loved. Harendra Singh has acted as a guide and a mentor to both the senior and junior men's team. He guided the junior men's team to a historic World Cup triumph in 2016, eleven years after a bitter and controversial loss to Australia in the semi-finals of the same event. As coach of the women's team, he guided the girls to victory in the Asia Cup and has been instrumental in their new-found self-confidence to fearlessly take on the best in the world. India lost their opener 2-3 to Wales in the Commonwealth Games as they took their time to settle in the first half, but came back strongly in the second. Down 0-2 in the first half, India dominated the second half to equalize and looked menacing, before Wales, against the run of play, stole the winning goal off a counter-attack in the final minutes. "I think we have conceded soft goals and also not been able to concentrate on PC execution. Need to be more patient." The coach's words after the match said it all and India will look to make amends against Malaysia tomorrow. Prior to the match, the Dronacharya awardee spared time to interact with Sportskeeda about his dreams and aspirations and the future of Indian hockey. Sportskeeda: Do you feel your preparations in the Bangalore camp and the South Korea tour were adequate for the Commonwealth Games and how confident are you? Harendra Singh: Yes, I think we have made some progress on the (Korean) tour. Most important, is the process and I think the women's team is on the right path in terms of the process. We are very confident of getting a great result in the Commonwealth Games. Sportskeeda: Do you feel India can now challenge teams like Australia, New Zealand, and England? We spoke to Savita Punia earlier, who said the girls now fear no team and will aim for gold. How did you manage to instil such great self-confidence in the players? Harendra Singh: I think it is all about self-belief and when self-belief comes, it automatically converts to team belief. We all keep everything simple so as to avoid players having a double-minded approach. I think everyone in the team has played their part. The players, scientific advisor, physio, and the psychologist. When improvement in areas, automatically self-belief starts growing. These highly-talented girls do not fear facing up to any opponents. It is all about being fearless and aggressive on the pitch. Sportskeeda: Gurjit Kaur has now added great value to the team. The absence of a PC specialist before was considered a weakness. How much difference will that make to our match-winning ability? 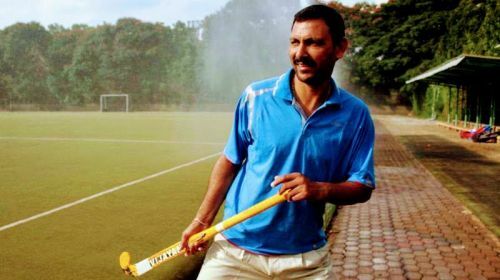 Harendra Singh: Drag-flickers all over the world play a vital role in the success of any team in modern hockey and that is why Gurjit has become an integral part of the team. She is working hard to get maximum number of goals for the team. Once any team starts scoring goals through PCs, it always acts as a cushion for the team and also as a threat in the opponent's mind. She is improving day by day and that is very important for any player and any team. Sportskeeda: Why do you feel so strongly that having a solid defence is the key to winning tournaments? The Indian men's team have traditionally played attacking hockey with not much emphasis on defence. Harendra Singh: My belief in a strong defence means when we lose the ball, we must regain the ball in a certain time-frame and once you start regaining the ball in a certain time-frame, it puts opponents on the back foot and that is where we always have an edge on the opponents. When we don’t have the ball, all 10 players on the field must attempt to go after the ball and not just the defenders. In field hockey, there is only one goalkeeper and 10 players who play the game on the pitch. The team which knows how to defend wins tournaments and the team which only knows how to attack can only win few matches. We are here not to win a few matches. We are preparing ourselves to win the tournament. Take the example of Germany. All their players know how to defend and how to attack. As a matter of fact, Australia, Holland, Argentina, and Belgium are all very good at defending. In recent years, the Indian team has recognised this and is also good in defending and also regaining the ball quickly. Sportskeeda: Do you feel defence is more important than a strong forward line? Harendra Singh: I think, we as Indians do not understand the defence concept or the attack concept. We still follow the old format, believing that he or she is a striker and he or she is a midfielder and he or she is a defender. In modern hockey, everyone is a defender and everyone is an attacker based on the team structure. Midfielders are scoring more goals from the top of the circle than strikers. You need to have balance in a team. It is a combination of both (attack and defence). Sportskeeda: You retired early from the team when you were a player citing politics. Indian hockey was going through a very bad phase then. Do you feel things are more professional now? Harendra Singh: After Hockey India was headed by Shri Batra Ji (Narinder Batra), Indian Hockey has become the most professional setup not only in India but among all the world's governing bodies. That is how sports should be run. Today, Hockey India has set a big benchmark for other sports. All the players, staff, administrators and the audience are enjoying Indian hockey due to Hockey India's professional set up and the credit goes to only one man for his vision planning and execution, Shri Batra Ji. The whole world is now looking towards Indian Hockey and one of the reasons for that is we have become totally professional which is the need of the hour. Sportskeeda: To be a good coach, what is most essential? Is it passion and patriotism, or is it a scientific, organised, and a tactical approach? Harendra Singh: I think you have already given the answer in your question. It is a mixture of all of those elements. You have to have all above tools to coach a highly professional team like the Indian hockey team. In modern hockey, you cannot survive if any of these elements are missing in your armoury. Without science, you can’t grow as a team and for that, you have to have knowledge of the sciences, the determination to achieve, passion to drive your team, patriotism to have a connect with the audience, players, fans, team, administrators, etc. Sportskeeda: You coached the junior men's team to glory in 2016. In 2005, we lost to Australia in the semis and you were extremely emotional. Did those memories inspire you to do better in 2016? Sportskeeda: I always carry my memories with me and that is how I get to inspire myself. I always learn from my mistakes and try to rectify them as soon as possible. The 2005 failure was a huge setback for me personally, as well as for Indian hockey. That is why I always look back and try not to repeat the same mistakes. Of course, I was waiting for the opportunity to erase those bad memories of 2005 in 2016. That is why we all worked very hard in every department and it is not just me, but all the players, staff, and administrators, all of whom contributed in this beautiful journey. I always aim high and at the same time, I am never satisfied in terms of results. The day we are satisfied, we stop growing, we stop discovering new ideas and thoughts. My aim for the women's team is very high and we all are working to fulfil our desires. Sportskeeda: Your passion for the game is second to none. What drives you? Indian hockey has gone through many bad phases. You never gave up and kept trying. How do you motivate yourself every day? Harendra Singh: My passion for hockey is next only to the Tiranga (tricolour). I love to watch every tournament if the Tiranga is at the centre of the podium. I think what I never achieved as a hockey player due to various factors drove me to pursue those dreams through the eyes of these young players. Also, it gives me immense satisfaction to sit and watch one of the players who has followed my guidance to then become a gold medallist, a recipient of Padma Award, etc. It gives me more energy to work towards the betterment of sports and society. I think the word failure is made by those who do not have the courage to face challenges. I always believe that being a human, we have enough power to change society and the lives of others. Only, we need to channelise the positive energy in the right direction. I am a daydreamer and always keep dreaming, and also at the same time, I try to fulfil my dreams through the Indian hockey players whom I guide regarding modern hockey.